The ‘twin' volume to that covering the French army north of the Somme before 1 July 1916, this book covers an almost unknown period to the average British visitor to the Somme. The ‘twin’ volume to that covering the French army north of the Somme before 1 July 1916, this book covers an almost unknown period to the average British visitor to the Somme. It also aims to serve as a ‘prequel’ to the events of the 1916 Battle of the Somme, though the ground covered in this volume is, perhaps, less familiar – but just as interesting and historic - territory. Beginning with the events of an earlier German invasion in the area, the book will also take a brief look at the period immediately prior to the outbreak of the Great War and includes a short study of the local territorial infantry regiment (who would see its first action near Amiens at the end of August 1914 - just days after many men of the regiment had seen their homes overrun by the German invaders), before moving on to the outbreak of war in August 1914. The book includes a description of the brief British occupation (from the river to just below the Amiens - St. Quentin Roman road) during the autumn of 1915, a barely known part of the history of the BEF. 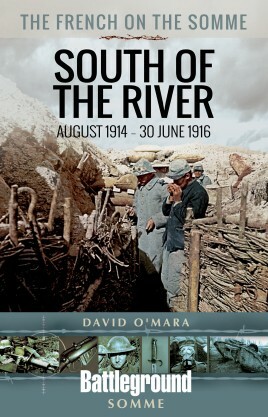 A study of this part of the Somme, complementing that of the north, is necessary if a person is to gain a more complete understanding of the battlefield itself and of the great offensive of the summer and autumn of 1916. As is the case with the northern volume, each chapter – detailing events in specific sectors down to regimental, battalion and even company or individual level from information gleaned from war diaries, regimental histories and personal diaries, accompanied by period and modern mapping and imagery – is followed by a tour of the sector containing a number of ‘stops’ in which it is possible to appreciate specific actions and/or a general overview of events in and around the particular location. The majority of these tours are accessible by vehicle but, for a more in depth look, proceeding on foot will be necessary. A feature of this series of books on the French army on the Somme are sections to educate the reader about aspects of the French Army that have been somewhat neglected or misunderstood for many years in English histories. In this volume the focus lies upon one of the more structurally confusing elements of the French Army - the Légion étrangère and its organization and actions on the Western Front from the outbreak of war until its near destruction during the Second Battle of Champagne in 1915. There will also be a brief explanation of the developing organization and structure of the French Army of 1915.